at the United States building at the Paris Exposition of 1900. It was given a fine flag cancel with the slogan PARIS | EXPOSITION | 1900. This cancel was applied by an American machine and the flag is Langford Type Z-27. This is the most common of the three machines at the exposition. There is one other American version which may have been a proof. 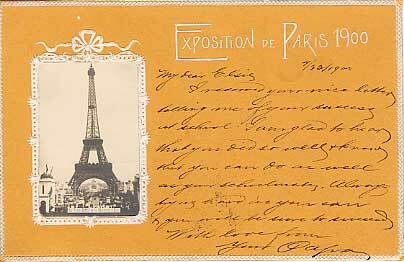 The fifth Exposition Universelle, held in Paris in 1900 was the most elaborate of all expositions held up to that time. It had 83,000 exhibitors and an attendance of 39,000,000 paid admissions with an additional 9,000,000 unpaid. A special U.S. Postal Station was situated in the beautiful U.S. Building. 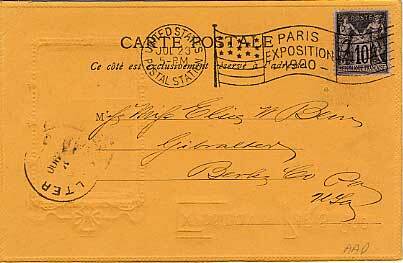 Mail of U.S. visitors as well as others, was postmarked there with a variety of postal markings, using French postage stamps, prior to being entered into the French postal system. As the Exposition site covered 549 acres, the French had a main post office, plus 7 different special postal stations within the Exposition grounds. The cover was franked with an 1890 10c Peace and Commerce black on lavender paper (Scott 106). The destination was Gibralter in Berkes County, Pennsylvania. Gibralter is about 10 km outside of Reading and 50 km northwest of Philadelphia. The illegible handstamp on the front is a receiver from Gibralter. The cover is illustrated with a vignette of the Eiffel Tower. The note is to a daughter from Papa. All in all, a cherished souvenir of a fine trip. *Thanks to Matt Liebsen for catching my typo.